Preheat about 2-inches of oil in a large (8 quart) pot to 350°F. Prepare a tray with double paper towel stack. Set aside. In a medium bowl combine buttermilk, egg, and hot sauce. Beat with a fork to combine. Drain pickle juice from pickle jar, add pickles to buttermilk mixture. Let sit for 5 to 10 minutes. In a separate bowl whisk together flour, paprika, garlic powder and cayenne pepper. Add a small handful of pickles to flour mixture. Swirl pickles around and make sure they are well coated. 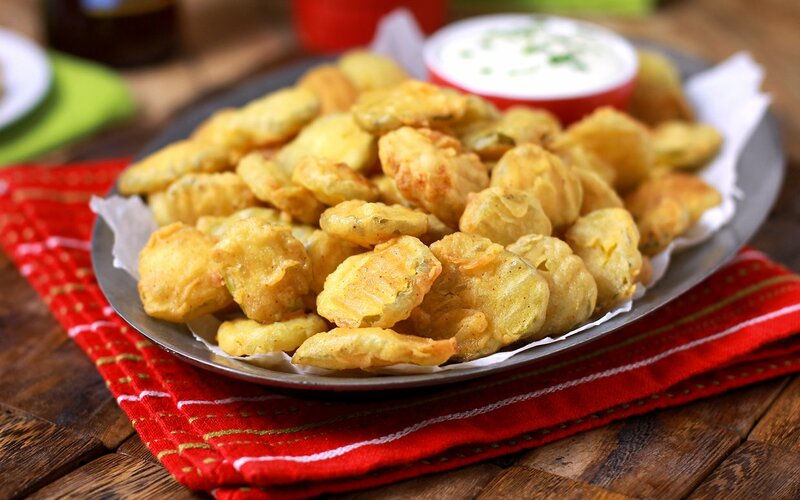 Shake off excess flour and drop pickles in hot oil one at a time. Only put 6 pickles at a time so the temperature does not drop, making your pickles soggy. Fry pickles for 3-5 minutes until they are golden brown. Remove from oil and drain on a tray lined with paper towels.